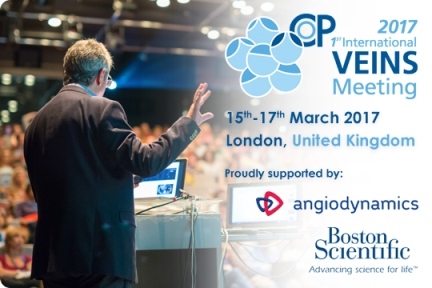 1st International College of Phlebology Veins Meeting, London U.K.
Our Vein Center’s team, Jacqueline Pal, CNP, and Dr. Pal returned Monday following a special invitation to participate in The College of Phlebology 1st International Veins Meeting, London, U.K. The meeting was held March 15 through 17th. Professor Mark Whiteley, Vascular Surgeon served as Chair of the conference. The program was quite unique in that it included live procedures which were streamed from adjoining procedural suites. We attended their excellent scientific session and also a hands-on workshop. As part of the international audience, we were able to observe and question the actual operating physicians during live procedures . These procedural cases included endovenous surgery, including perforator vein ablation and live abdominal and pelvic ultrasound in search of more complicated higher vessel abnormalities. This event also streamed a pelvic vein embolization procedure on a female patient with pelvic pain due to her pelvic (vein) congestion syndrome. We found it helpful to view the procedure with a patient’s perspective in mind (she was able to talk with us) but it also was as an excellent update in current best vein disease practices. A second session concentrated on the science and developments in venous surgery. This session included cellular biology (histology) and venous blood flow dynamics; It also included new techniques in vein treatments and aesthetic vein treatments. We especially appreciated those talks with our colleagues regarding the actual vein wall response to the various types of lasers or catheter fiber treatments and the various sclerosing agents (sclerotherapy drugs) and their cellular effects on the vein wall. How the vein wall may react on each individual patient basis in the vein wall was a topic we found interesting and helpful . These factors affect patient treatment outcomes and should be considered in vein treatment decisions. A third session was run by the Leg Ulcer Charity of the UK . This was a very good review and update on how to evaluate, differentiate, treat and monitor (venous) leg ulcers. We are certainly looking forward to the roll-out of the soon-to-be launched mobile ‘Medopad’ app. This tool will help patients to communicate and to monitor their own venous wounds closely using a phone app and sharing with their physicians, nurse practitioners or nurses to enhance an organized approached to healing. Not only did we enjoy the smaller conference venue, the international faculty and international participants, we reconnected with familiar faces (professional friends) and were even able to do a bit of self-guided touring by way of Westminster to Buckingham Palace. It’s nice returning to Minnesota with new technical information and ideas to advance our patient care and we feel refreshed from a rewarding international experience.